Manuilsky, Dmytro [Мануїльський, Дмитро; Manujil's'kyj], b 3 October 1883 in Sviatets, Kremianets county, Volhynia gubernia, d 22 February 1959 in Kyiv. 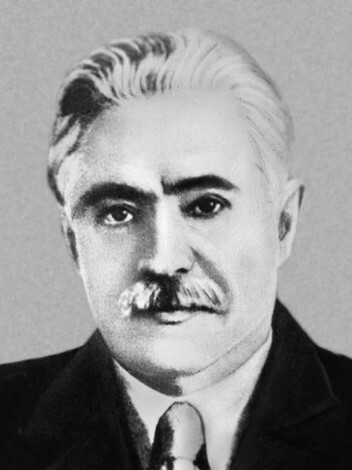 Bolshevik revolutionary and Soviet functionary; full member of the Academy of Sciences of the Ukrainian SSR from 1945. A member of the Russian Social Democratic Workers' party (RSDRP) from 1903, he studied at Saint Petersburg University and helped organize the 1906 Kronstadt and Sveaborg mutinies. He was punished with exile to Yakutiia, but he escaped and worked in the RSDRP underground in Kyiv. After fleeing to Paris in 1907, he belonged to the Vpered group and completed his law studies at the Sorbonne (1911). In 1918 he became a member of the CP(B)U Provisional Bureau and deputy head of the Soviet delegation that negotiated with the Hetman government in Kyiv. Then he headed the Political Committee for the Defense of Kyiv (July–August 1919) and attended the secret conference of Ukrainian Bolshevik ‘federalists’ led by Yurii Lapchynsky (November). Siding with Moscow, he was appointed member of the All-Ukrainian Revolutionary Committee (1919–20), special delegate to the Soviet-Polish negotiations for the Peace Treaty of Riga (1920), member of the CC CP(B)U Politburo (1920–3), people's commissar for agriculture in Ukraine during the famine (see Famine of 1921–3), and first secretary of the CC CP(B)U and editor of its organ Kommunist (1921–2). From 1922 he held senior posts in the Communist International. As secretary of its Executive Committee (1928–44) he supervised the Stalinist purges and terror in the Comintern apparat and foreign Communist parties, including the Communist Party of Western Ukraine. From 1944 to 1950 he was deputy chairman of Ukraine’s Council of People's Commissars (from 1946, Council of Ministers of the Ukrainian SSR), people's commissar and minister of foreign affairs, and head of the Ukrainian delegation at the United Nations. He was a member of the delegation of the Ukrainian SSR at the signing of Paris Peace Treaties of 1947. In 1950 he fell into disfavor and was forced to retire.